In November each year, on the first Saturday of November, the famous Bridgwater Carnival takes place – a procession of up to 120 or more illuminated floats through the town centre streets by night. Held to commemorate Guy Fawkes’ Night, the tradition extends back over 100 years. Once, a boat was burnt on the Cornhill every year, but this practice was discontinued for two reasons: a shortage of old boats had led over-enthusiastic carnivalites to drag perfectly good boats out of the river and set them on fire (without the owners’ agreement), and secondly, tarmacking of the streets meant that fires of that magnitude could set the tar alight. Carnival “gangs” – often based around a particular workplace or pub – compete to produce extravagant – and often over illuminated – floats based around a particular idea or theme. Some are motionless “tableaux”, where the participants must remain stationary, but the vast majority of floats feature loud music and a lot of either dancing or movement. Costumes, floats, trailers and tractors (which tow the floats) are all decorated and painted as colourfully as possible. All costumes and decorations must be made by the gangs themselves and must not be professionally made or bought in. Also, gangs are not allowed to re-use items from previous years’ floats. It takes up to three hours for these “carts” to complete their route through the town; at one time carts were just that – carts lit by candlelight, pulled by shire horses. Now the “carts” have grown to juggernaut proportions and lighting is electric – the thousands of light bulbs are powered by the cart’s own generator, and the cart itself is towed by a tractor. The heat generated by all the light bulbs is sometimes very welcome on a frosty November night! The carts take about a year to design and build, and as soon as one year’s carnival season is over, it’s time to begin work on the next year’s cart. Bridgwater is the first and biggest of the Somerset winter carnival circuit; a series of carnivals follow Bridgwater, but none of them has quite the same atmosphere or the number of carts as Bridgwater. The procession is followed by a squibbing display in the High Street. These “squibs” are giant fireworks, made to order, held aloft all along the street by carnival gang members, in a synchronized (and very spectacular) display, as sparks shower down all along the High Street. Due to the expense, the display had been in danger of dying out, but sponsorship from Nuclear Electric has enabled it to continue. The Carnival annually draws a crowd of between 100,000 and 150,000. It is probably the largest illuminated carnival in Western Europe, and special coach trips are organised to see it. In addition to the Carnival, another annual event which swells the town’s population (albeit briefly), is Bridgwater Fair. Held at the end of September in St. Matthew’s Field on the western side of town, it lasts 4 days – from Wednesday until Saturday. County fairs were once commonplace, giving rural folk the opportunity of trading their livestock and produce for other goods not made locally, as well as meeting friends and relatives they might not otherwise see from one year to the next. Both these aspects of fairs tend to have largely disappeared elsewhere, but at Bridgwater Fair, not only is there a large fairground, but it also includes a street of stalls and market traders, leading away from the fairground. And here, although it is by no means as common as it once was, it is not unheard of to hear people saying to each other “See you next year at the Fair”. 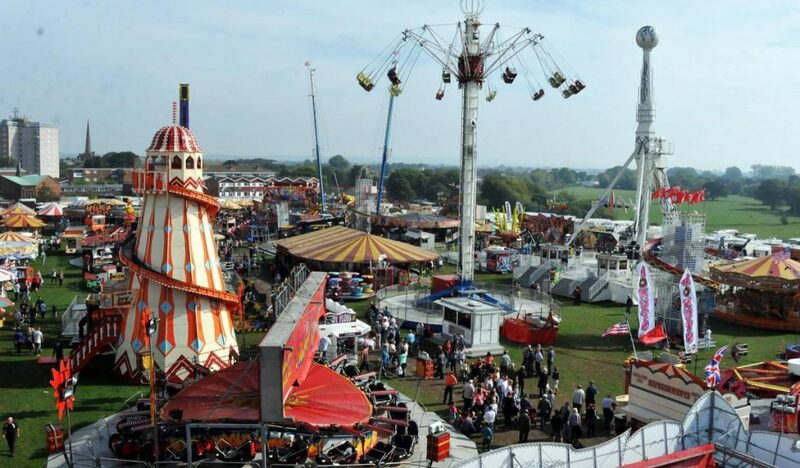 The Fair is comparable with some of the larger fairs in the country, such as Nottingham, and is usually estimated to be the third or fourth biggest in the country.